Skyscrapers in Seoul: New Yorkers Asymptote Architecture are the latest firm to reveal designs for the Yongsan International Business District of Seoul and have proposed two skyscrapers connected by a bridge 125 metres up. Named Velo Towers, the buildings will comprise stacks of rounded blocks that look like the rotating camshafts of an engine. The tallest of the towers will stand at 153 metres, substantially shorter than the neighbouring 200 and 300-metre-high skyscrapers proposed by architects BIG and MVRDV for the South Korean commercial district that was masterplanned by Daniel Libeskind. The towers will be clad in glazed panels with frames coated in pearlescent car paint. The completed towers will contain a total of 500 apartments, while lounges and gym facilities will be housed within the two-storey bridge. Asymptote Architecture are one amongst a host of international architects that have been commissioned by developer DreamHub to design a landmark tower for the emerging commercial centre. See all of our stories about the district here and see images of each project in our special slideshow feature. New York, June 12 – Asymptote Architecture principals Hani Rashid and Lise Anne Couture are pleased to announce the launch of the Velo Towers, within the Dreamhub development in the Yongsan District of Seoul Korea. Asymptote's project is designed as an integral part of the master plan accommodating several new projects that are situated along the newly planned Yongsan Park. Neighboring projects include MVRDV’s Cloud Towers, the Cross # Towers by BIG Architects and Project R6 by REX. The Velo Towers are composed as a dynamic arrangement of stacked and rotated volumes that are a formal and programmatic counterpoint to the conventional extrusion of massing that exemplifies the supertall as a building type. 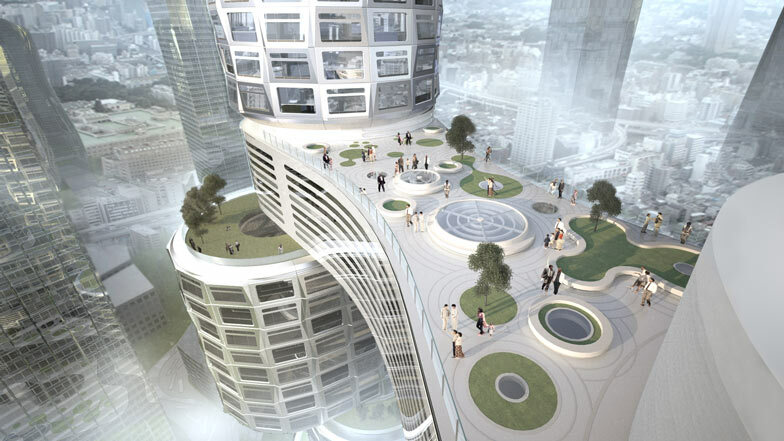 By breaking down the scale and massing of the two distinct towers into interconnected circular and oblong volumes, the Velo project proposes an alternative architectural and urbanistic response to the repetitive and monolithic austerity of conventional tower design. The recombination of the typical tower form into a new horizontal and vertical configuration enables the formation of a socially engaging and dynamic environmental response, as well as the creation of a discreet yet compelling architectural landmark for the Yongsan district. The Towers' eight distinct residential components are rotated and positioned within a carefully choreographed massing arrangement, calibrating the orientation and views of each residential volume and taking full advantage of the Towers' position adjacent to the Yongsan Park overlooking the Han River in the distance. With a collection of roof gardens, shared amenities and internal circulation around light filled open atrium spaces, the vertically distributed massing elements create unique 6 to 8 storey residential communities on the skyline. The towers are joined by two bridge structures that house shared public amenities, and act as neighborhood scale 'connectors' for the towers’ residents. The building's raised plinth hovers above the communal landscape surrounding the base of the Towers while the Skybridge floats 30 storeys above; housing fitness and recreations centers, lounges, pools, spas and cafes along with a sky garden providing spectacular views over the entire Yongsan site. While the overall massing of the Velo Towers is comprised of a dynamic arrangement of rotated and stacked components, the architecture of the towers is further articulated volumetrically and materially at the scale of the facades. The unique faceted façades of the Velo Towers are comprised of large prefabricated components consisting of glass within custom molded composite shells finished in pearlescent automotive paint. The 500 individual luxury units that vary in size from 45m2 to 82m2 are also designed for compatibility with custom prefabricated plug-in interior components. Asymptote's design of the Velo Towers exploits the latest advances in design, materials and digital fabrication that are now prevalent in present day automotive, aerospace and marine industries. The merging of these with the latest technological advancements in architecture and the ways in which components can be fabricated and buildings assembled, is enabling Asymptote's vision for the Velo Towers to be realized.